This weekend has been pretty productive for me, I got the cushions finished and made good progress with the jacket pattern for the grey wool.. I have kept it pretty straight forward. I have a limited amount of fabric, so I cannot go too mad on seam detailing etc. This is the initial sketch, nothing over the top. 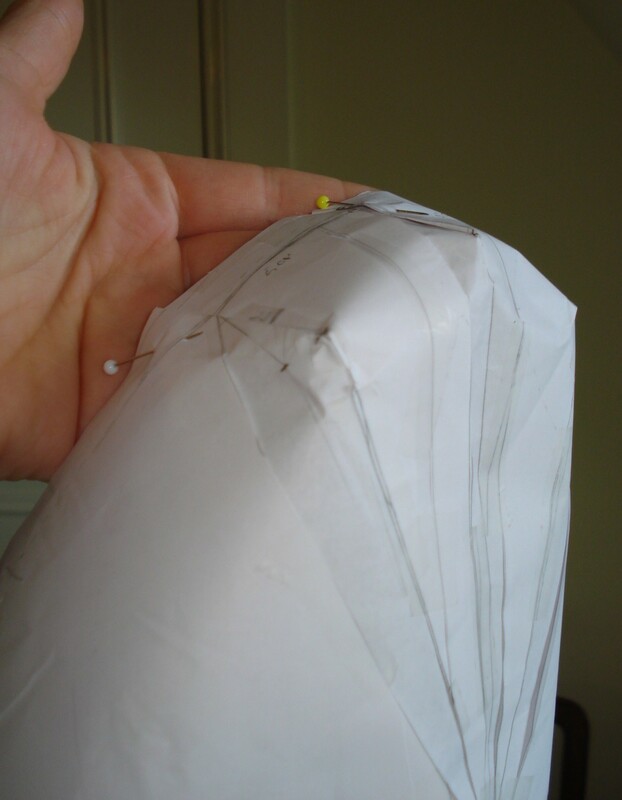 Pattern for Sleeve Head - see all the alterations?? I altered the sleeve head to accommodate 3 short darts. It took a while, and was tricky with all the layers of paper I already had going on! This has the effect of adding about 3m to the width of the shoulders, which is great if you have no waist little waist definition. 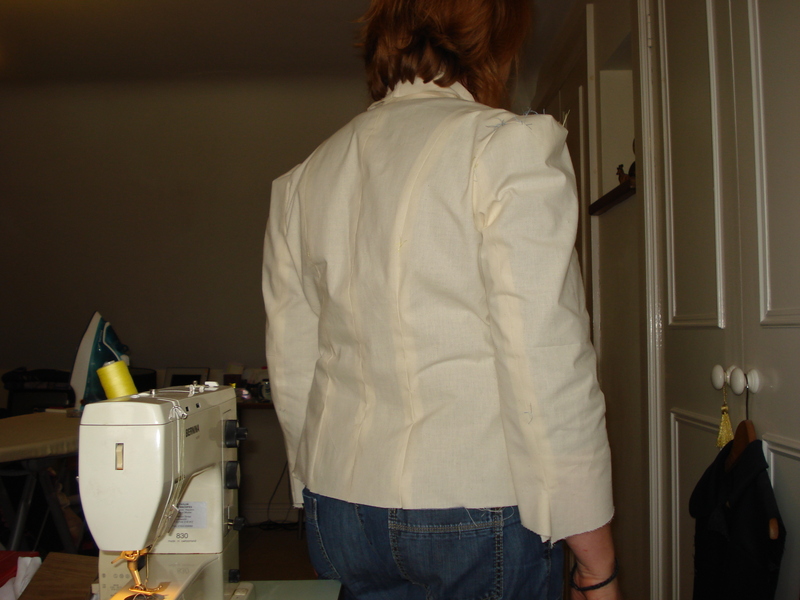 Broadening the shoulders makes the waist appear narrower than it really is – bonus!! 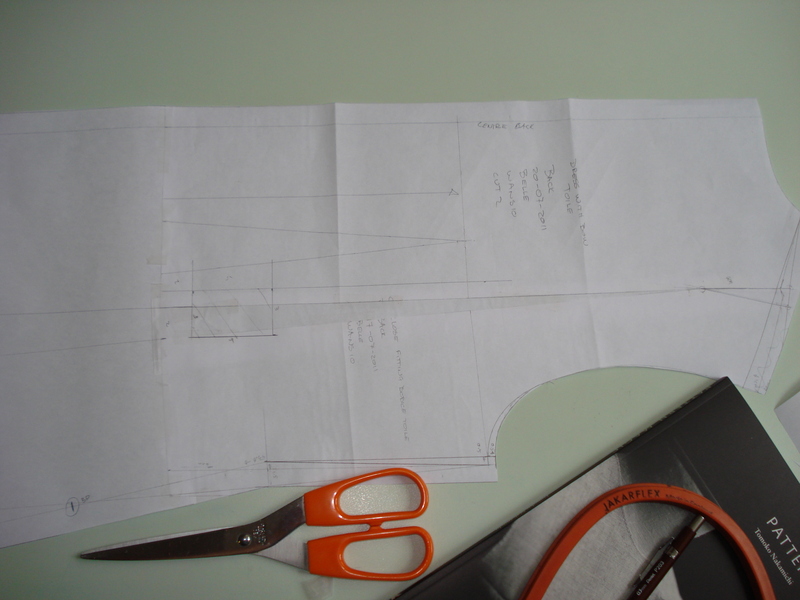 I also cut the sleeves 10cm short, and kept an angled hem line. 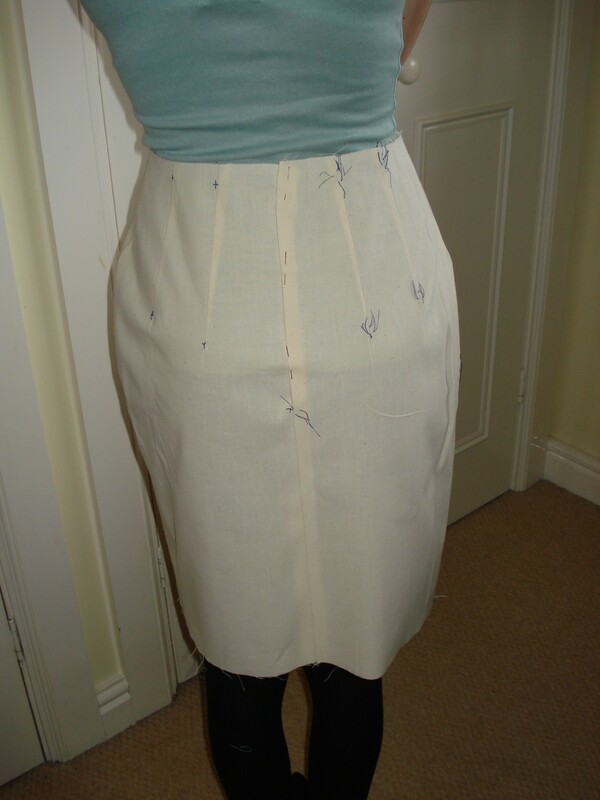 I added 2.5cm flare to the back seam of both the upper and lower sleeve. 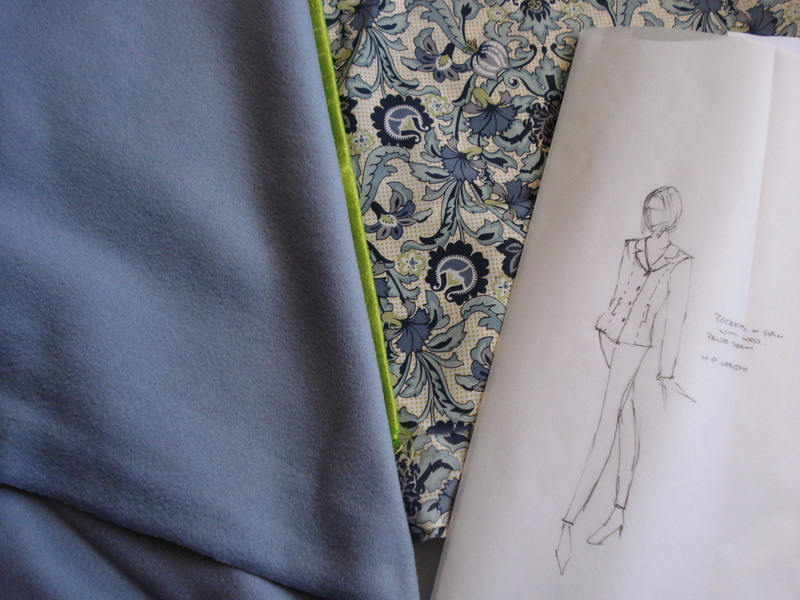 Jacket pattern pieces, pinned on calico to toile. 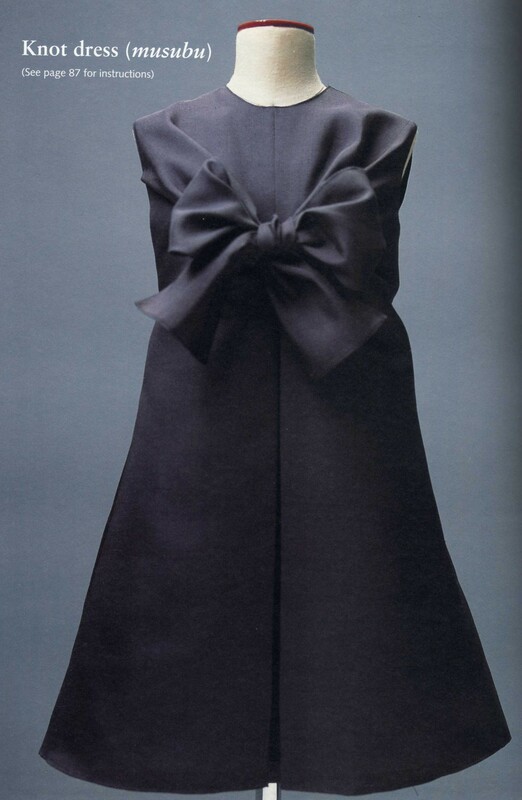 So it looks pretty good, but – the collar and rever combination appear a little small with the new sleeve-head. 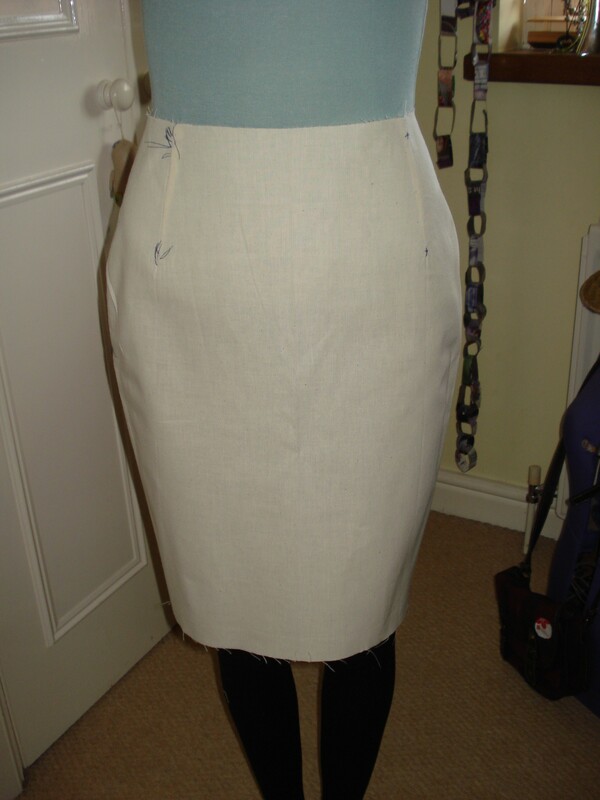 I think the rever could do with being 2cm wider, and the collar needs to be adjusted so the proportions are correct. But if I still had a “normal” sleeve-head they would be fine. Front, see those sleeves! 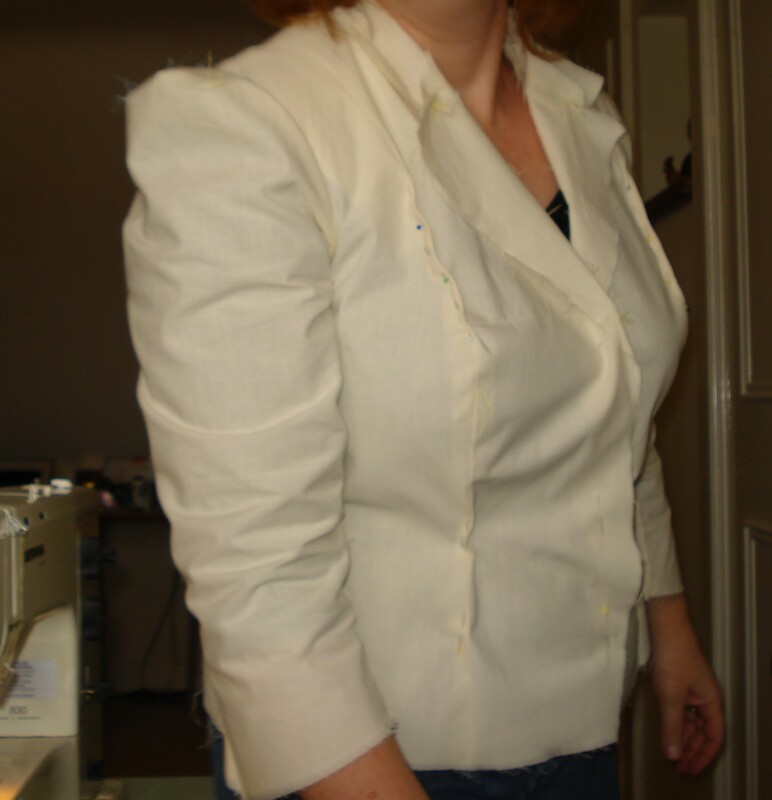 Fitting alterations are pinned. This is where the “2 for 1” comes in. 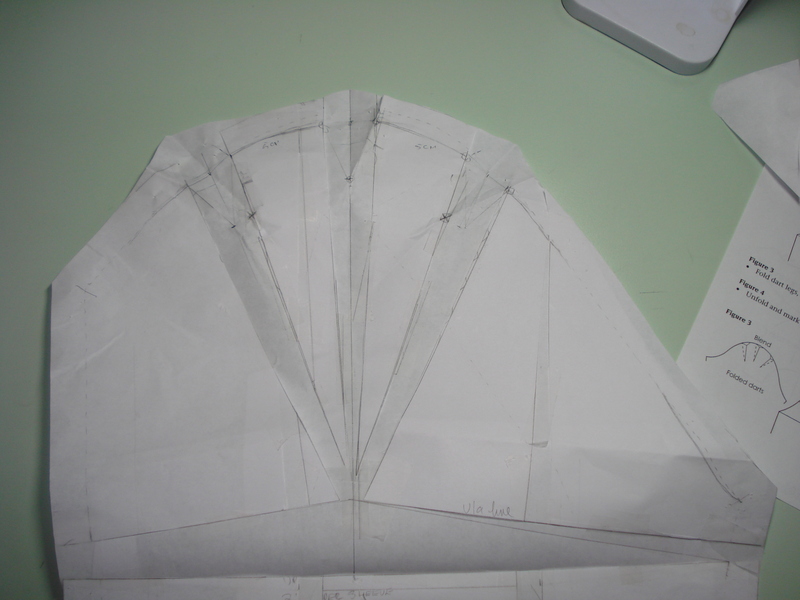 I will trace off another sleeve from the sleeve block, and keep the head normal. This will work just fine in the jacket as it is. 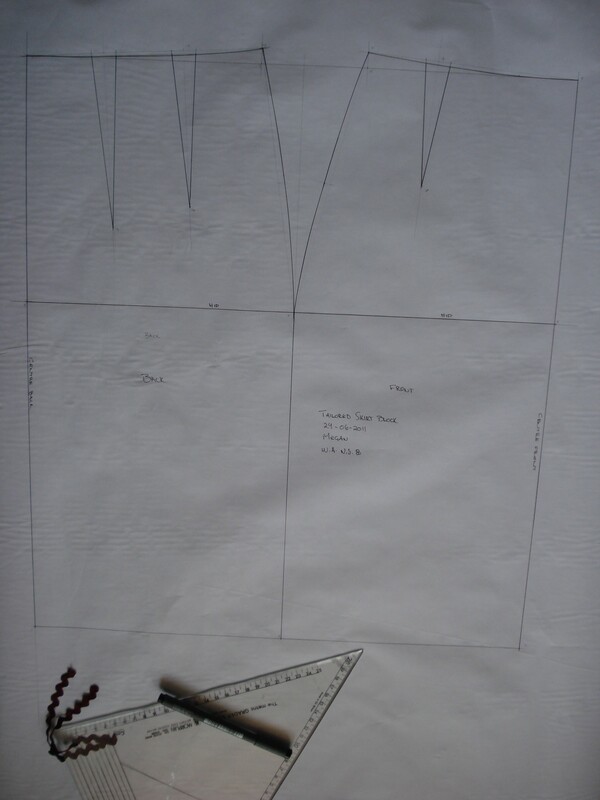 Then I will trace off the front panel and adjust the rever and draft a new collar. This front & collar will be used with the big sleeve. The rest of the jacket can stay exactly the same! 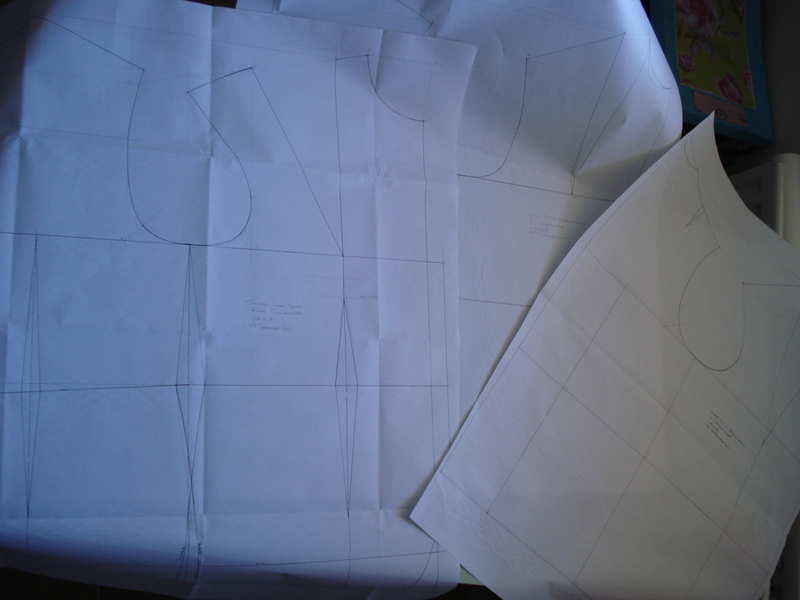 So I have two patterns – yay!! Sorry about the fuzzy pics, I was using the self timer, and I cannot work out where to stand to be in focus!! 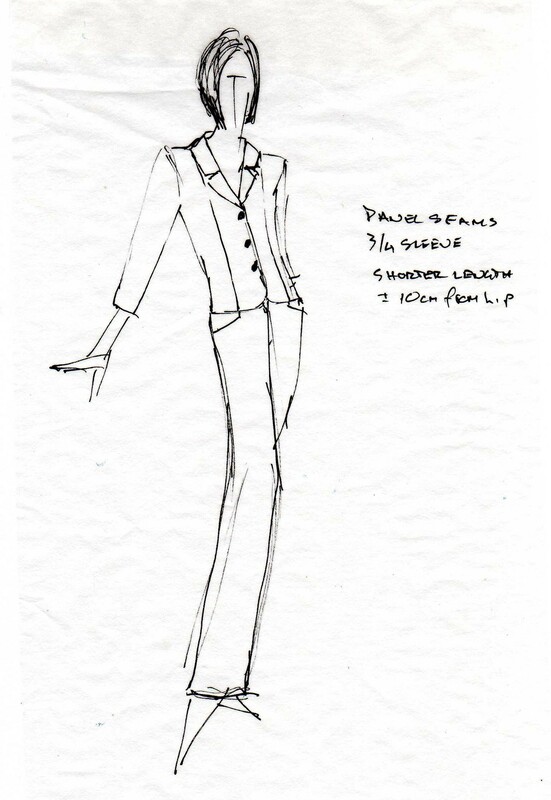 So what do you think of the collar & rever vs sleeve proportions?? Wow, I can honestly say I am gobsmacked! This little blog of mine has been ticking along with a handful of visitors, when suddenly the tracking spiked!! Thank you so much to BurdaStyle for making me featured member of the week! Another big thank you to those who have added my blog to their subscriptions lists, and those who left me comments. So back to work! I have re-drafted some of my personal blocks. After making the jacket this last month and having way too many adjustments to make, I gave in. 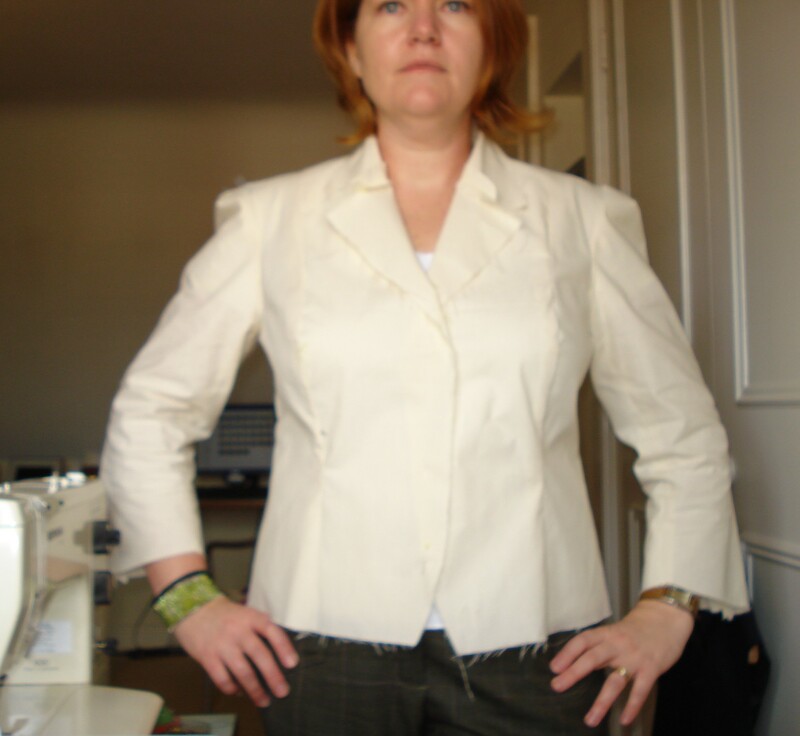 So yesterday I drew a new Jacket Block, Coat Block, Close Fitting and Easy Fitting Bodice Block. They will all be used this season! I still need to toile and fit them, and draft their respective sleeves, but in the mean time I thought I’d share what I intend to do with them! 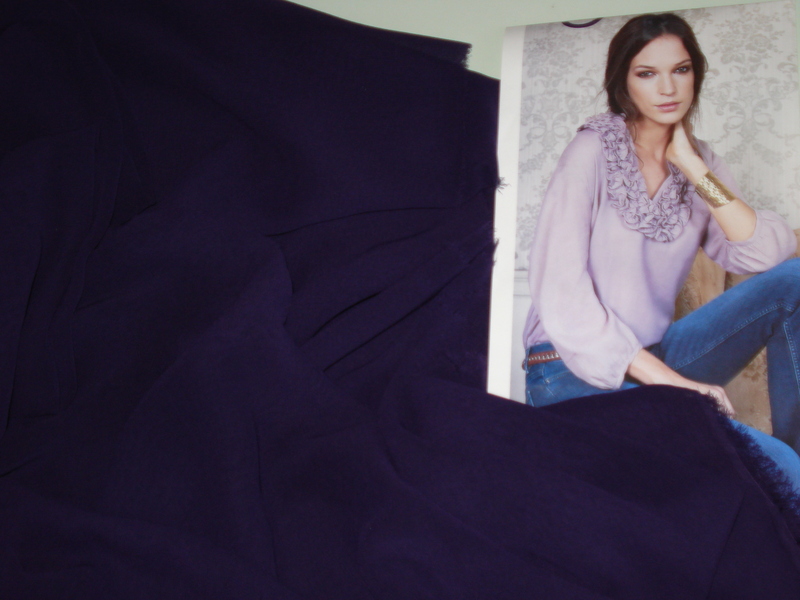 I have a lovely purple georgette that has been begging for something pretty and floaty. 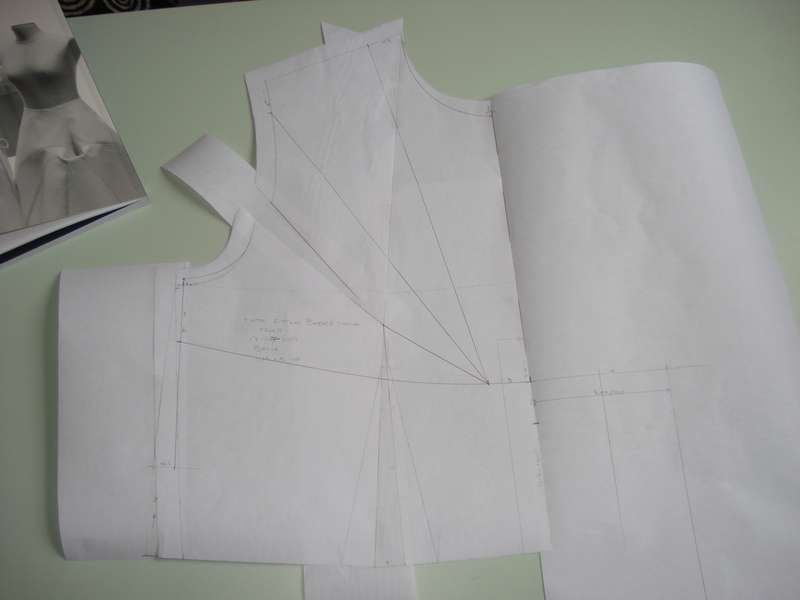 I am going to use the Easy Fitting Bodice Block to make a loose-fitting top with a dropped shoulder and ruffles along the neckline. Isn’t that top cute? And purple will make a change to my usual grey, black or blue! The georgette is not silk, unfortunately, but I loved the colour when I saw it on Ditto Fabric‘s website, so I had to have it! Next, the Close Fitting Bodice Block will be converted into a One-Piece Dress Block and then I will adapt the bodice and sleeve to form a Kimono Block. 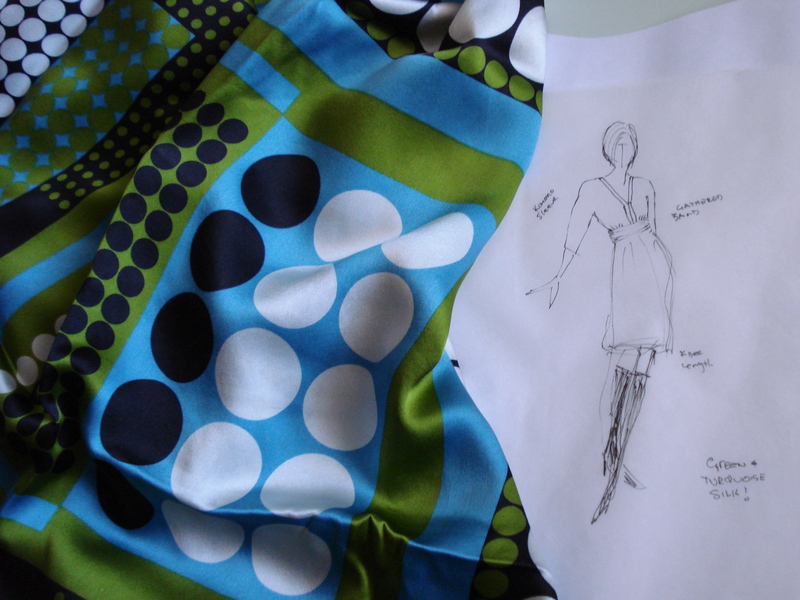 I have FINALLY decided what that green and turquoise silk is going to be! The Coat Block is going to be a hip length Pea Coat in the most beautiful pale, ice-blue cashmere that I bought at Fred Winter back in January on their winter sale! I already knew I wanted something different, so I also got some Liberty silk for the lining and some Dupion to make piped details! 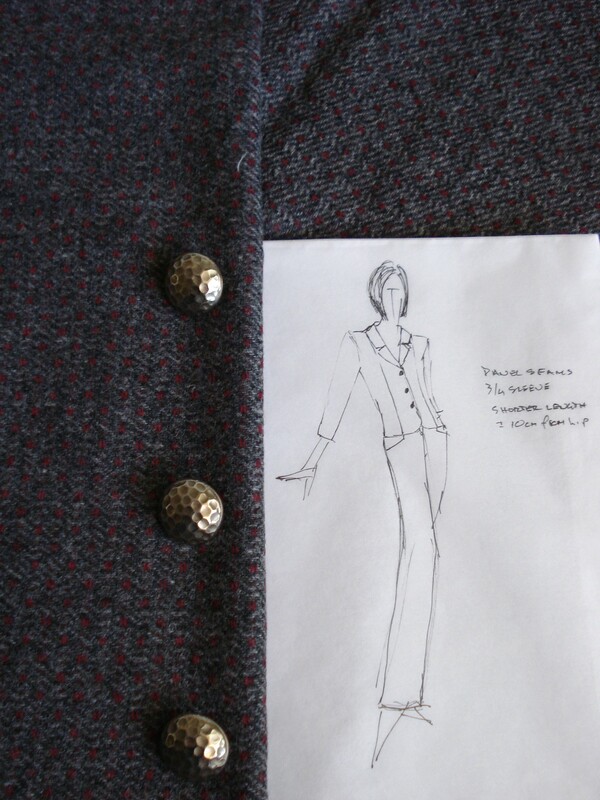 And the Tailored Jacket Block?? Something simple. A cropped jacket with 3/4 length sleeves, possibly cut on the bias to take advantage of the burgundy/maroon flecks in the grey wool I got last week at Fred Winter. I was really good, only getting 1.7m instead of going for the remains of what was on the roll, 2.5m! I am sure I would have used it somewhere, but if I had got 2.5m I just know I would still be procrastinating this time next year! I am going to use the last three buttons from my antique shop purchase, the others are on the Spotty Jacket. 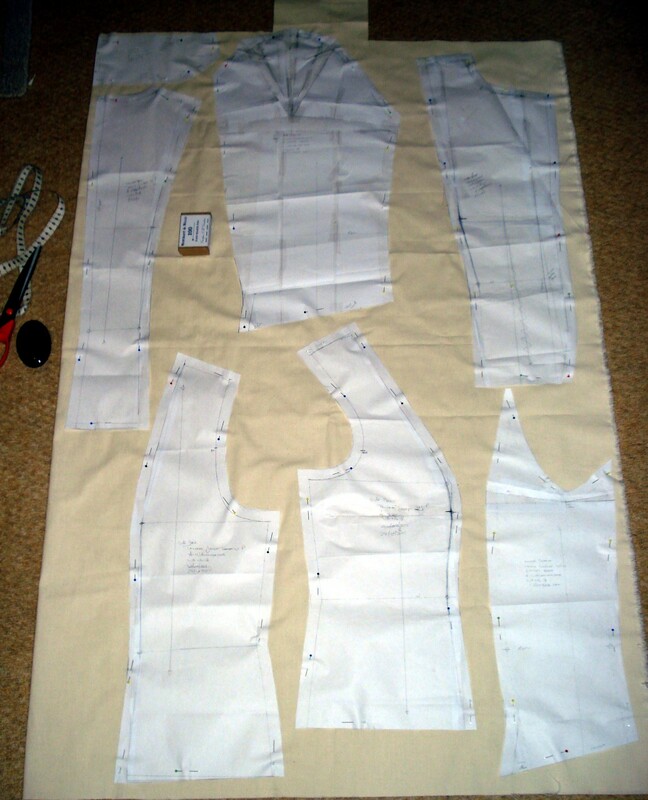 Author Anne WPosted on 30/09/2011 30/09/2011 Categories design, pattern cutting, tailoringTags 3/4 sleeve, bodice block, coat, dress, fitting, jacket, Liberty, pattern cutting3 Comments on Friday – busy day! 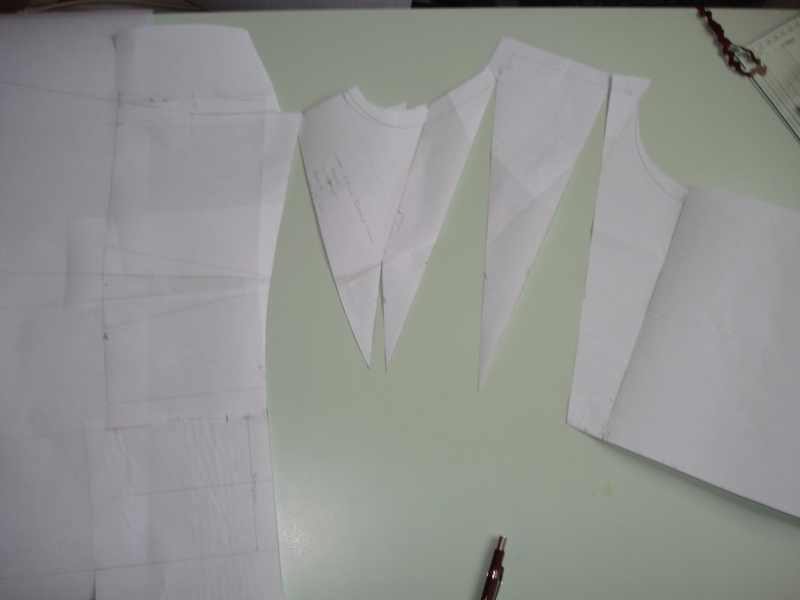 I have finally got the bodice blocks drafted and adjusted. This morning, with the damp and dreary conditions outside, I decided would be the day – the Magic day! 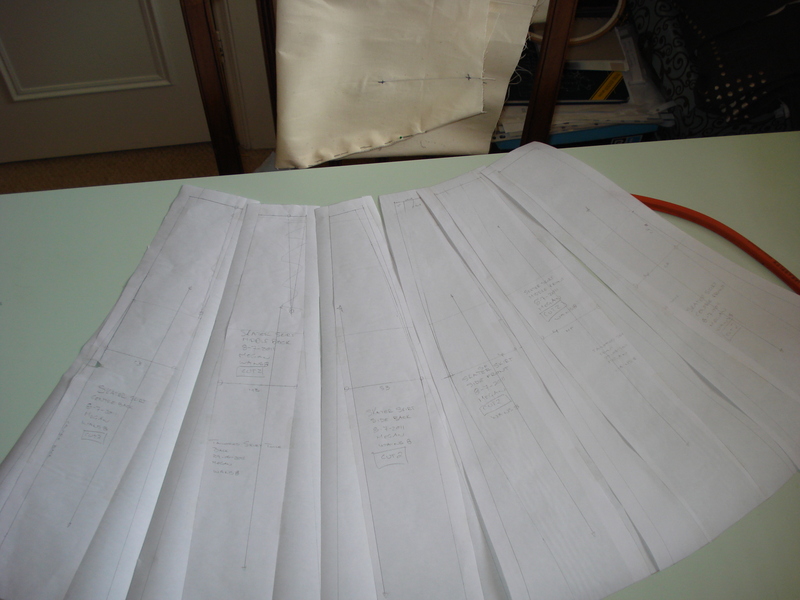 I have adapted bodice blocks drafted from Winnifred Aldrich to the style of the block in Pattern Magic. Now I am having a brilliant an interesting time playing with the adaptations. 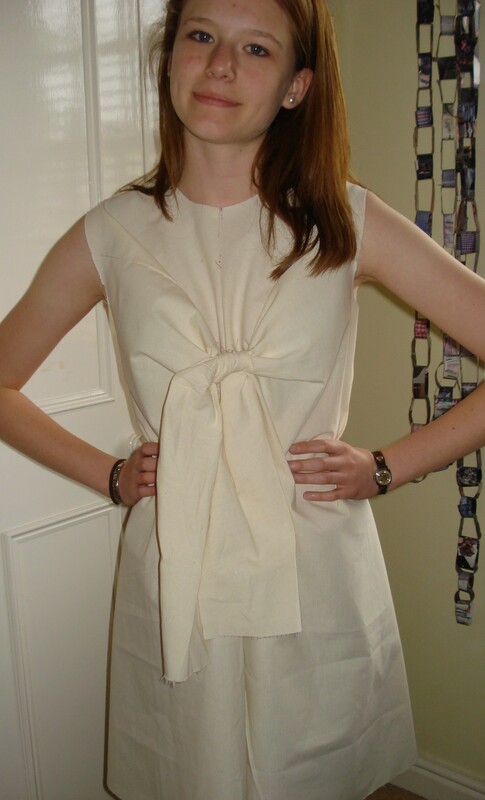 I really want to get the toile finished by school pick up time!! 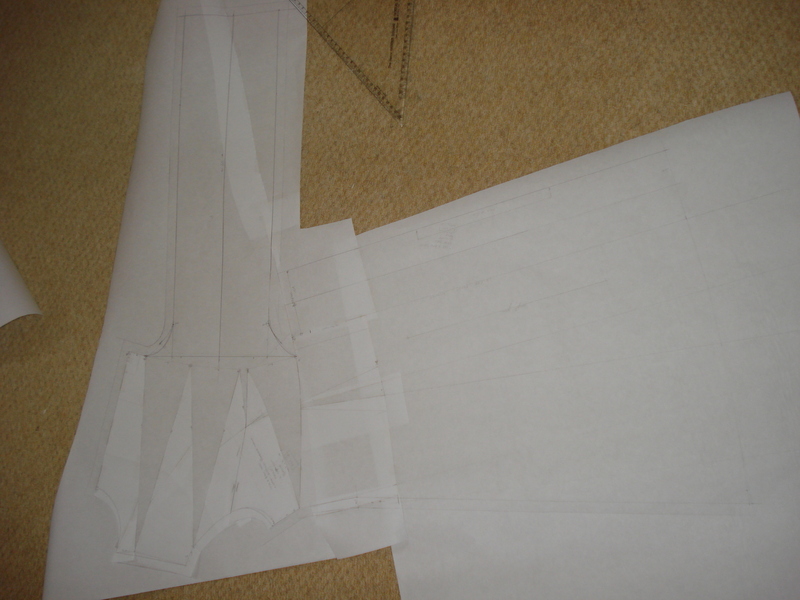 Here are some pics of the patternwork in progress today. 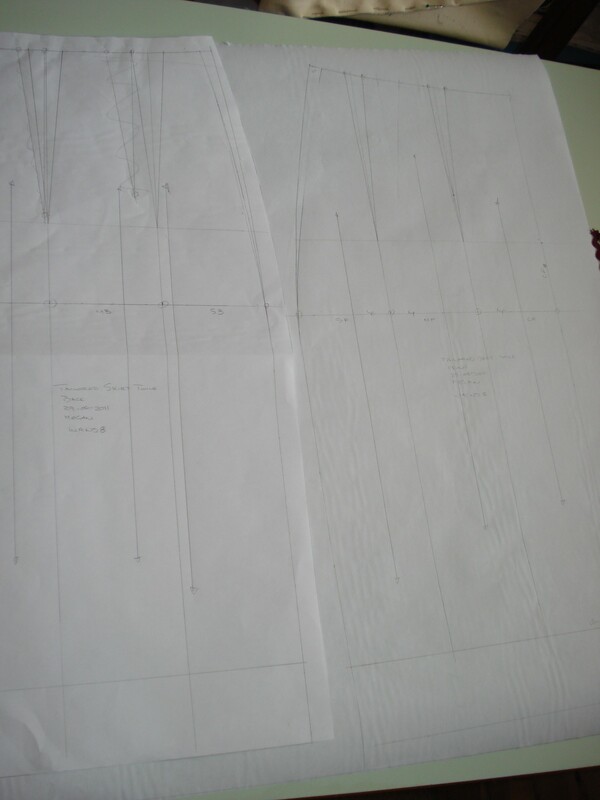 Front is marked up with the pleat and the slash lines, just needs the skirt for the dress. 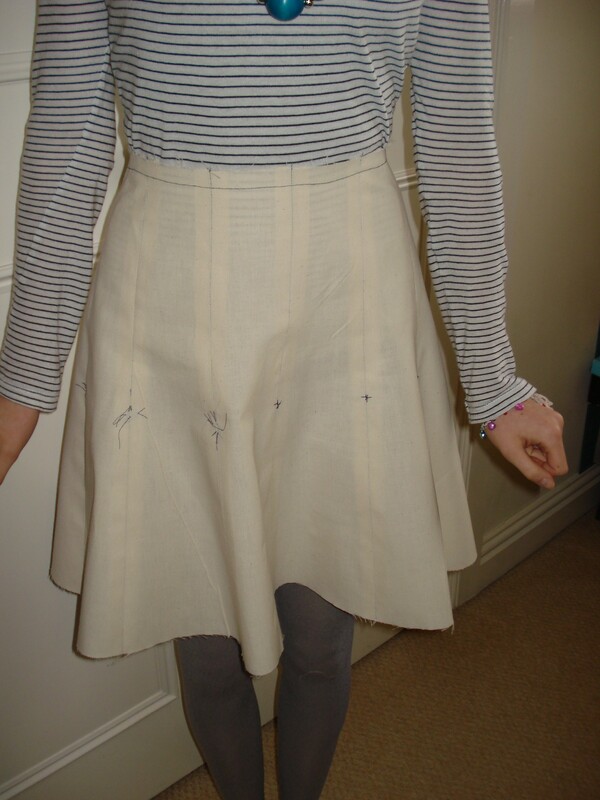 Skirt added, lines slashed and armhole dart closed. There is an 8cm gap between all the slash points. Just look at the size of that monster! I recon this is going to take quite a bit of calico. The back is much simpler. On the subject, I notice Amazon UK have another book by Nakamichi Tomoko, Pattern Magic: Cut and Sewn. I wonder how long it will be until this is available in English?? So now I just need to figure out how it all goes together. Hopefully the toile plays ball and there will be more photos later. 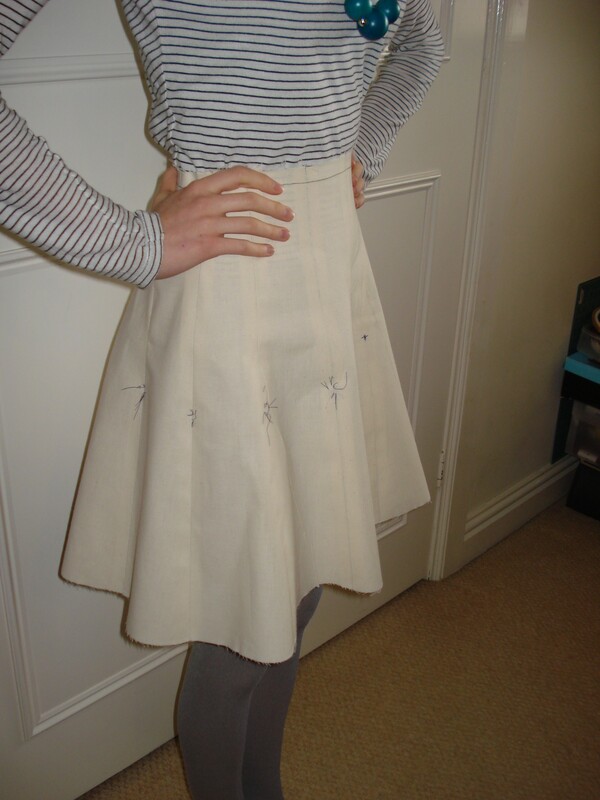 Toile complete! 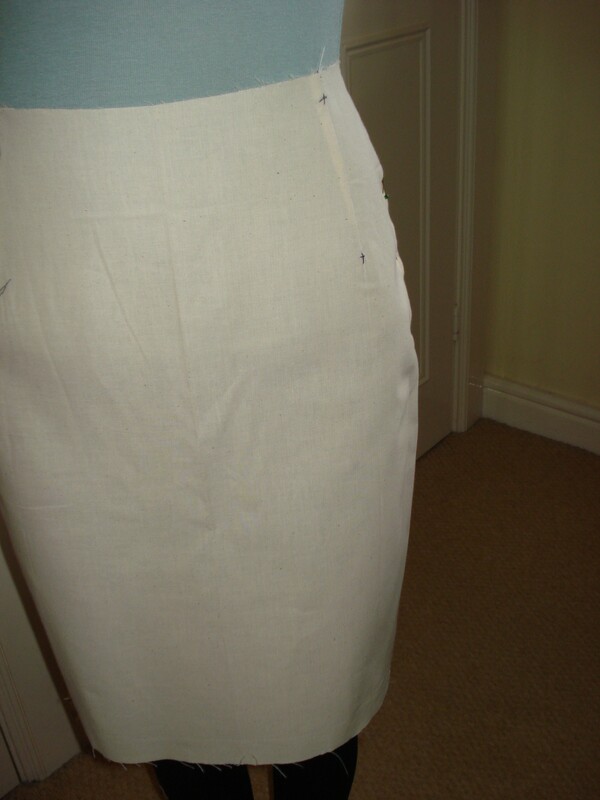 I altered the pattern slightly, leaving off the pleat in the front, and adding a 6cm flare instead. I think I might just leave this off too, as the front is wide enough! 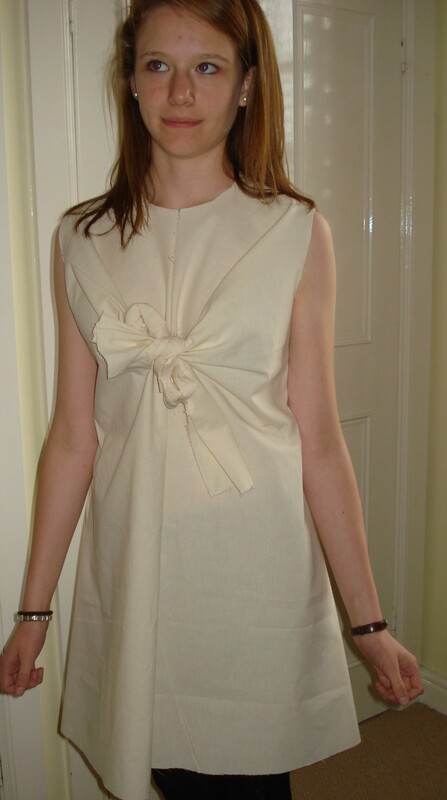 Daughter no 2 likes the style, but wants it more fitted in this weight fabric. 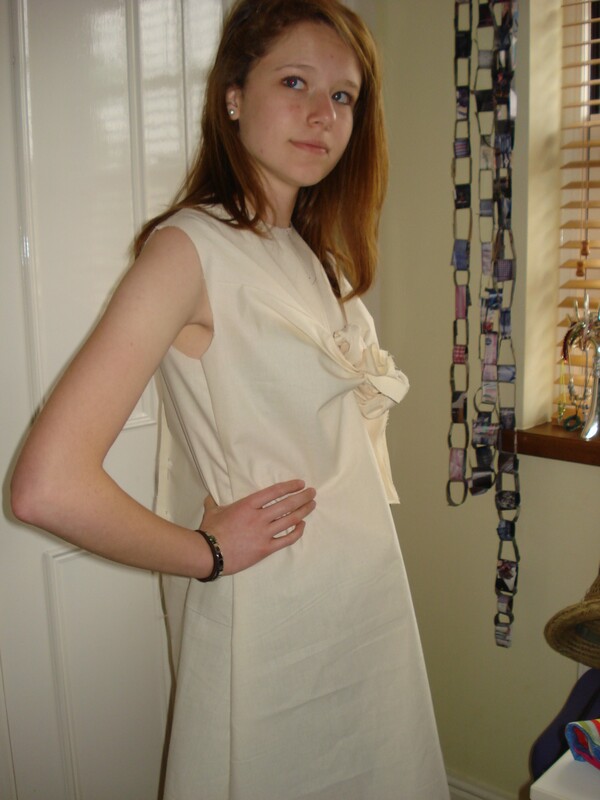 So I was thinking of making it in linen… I will have to make it more fitted to the waist if I do it in linen, but apparently it won’t “be so bad” if I use a floaty fabric. I just may have something in my stash. I guess I am off to source some suitable fabric now!